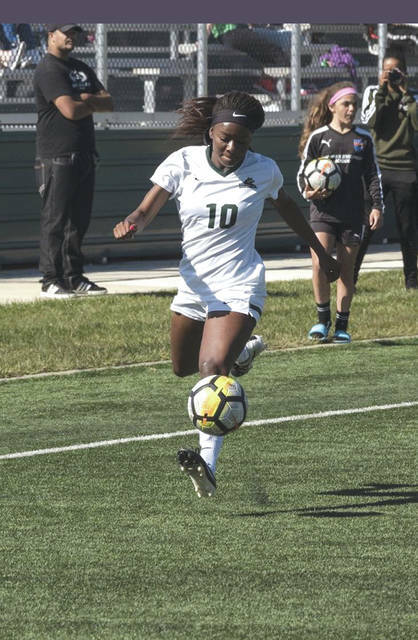 Senior and Fairborn High graduate Aaliyah Patten is one of three returning Horizon League first-team selections on the Wright State women’s soccer team this season. FAIRBORN — Wright State University women’s soccer coach Pat Ferguson pointed to his team’s pace when describing their strengths. Coming off a 12-8 record last season, the Raiders hope also to stay ahead of their conference foes in the standings and on the scoreboard in their league tournament. The Raiders will field an ample amount of upperclassmen leadership this season, including six seniors and eight juniors. Additionally, there are eight more returners. Fairborn High grad/senior forward Aaliyah Patten and midfielder Mattie Cutts, along with sophomore forward/midfielder Erin Graefen, were Horizon League First-Team recipients in 2017 and accounted for nine goals and 13 assists. The trio of forwards: senior Kayla Schrubb (Piqua HS), junior Jordyne Helinski and sophomore Brittney Petrosky (Vandalia Butler) tallied 10 more of last season’s goals. Junior defenders Alysha Harmer (Tippecanoe), Christine Ommert (Springboro) and junior goalie Maddie Jewell (Lakota West) return to a WSU squad that was tied for first in league games for shutouts with five. With the addition of 11 freshmen on the roster, that experience should pay off. Ferguson says this has been integral to success in his 23 years of coaching. WSU will have its share of tests during non-conference play. This includes matchups against Louisville, Tennessee and Cincinnati on the road. “We have a tough season leading up to conference. I think that’s going to get us more prepared to play our opponents,” Cutts said. Last season’s 12 wins was the most for WSU since 13 victories in 2007. The campaign culminated in a 2-1 loss against Milwaukee in the HL tournament semifinals. The players agree this will be a major source of motivation for a program that had its three lone tournament crowns from 1998-2000. Players in this year’s freshmen class to keep an eye out for on the pitch could be midfielder Reagan Clark, Sydni Callahan and Taylor Ulrich. Junior newcomer and midfielder/defender Naomie Guerra (Loveland), who transferred from William Carey University in Hattiesburg, Miss. and represented Trinidad and Tobago over the summer, should add a spark defensively. The numbers say the Raiders are capable of reaching great heights, and it appears, they have enough heart to do it too. The Raiders lost an exhibition game in Indianapolis to Butler University, defeated Bowling Green in a home exhibition, and had an exhibition game with the University of Dayton cancelled due to weather. The 2018 regular season commences Aug. 16 at Louisville for WSU. Story provided by Alan Hieber, WSU Communications, wsuraiders.com.